Sporst were a huge part of Amy Hever's (left) life growing up. Now, she's helping a pro sports franchise be better off the court. Talk about full circle. The Sixers are leading the way in the NBA when it comes to putting women in charge. Meet Amy Hever, executive director of social responsibility, and read our other profiles here. Amy Hever was born Emiko Hever, but her parents changed her first name before she went to school, she said, on a whim; or, perhaps because it would be easier for Amy Hever to assimilate in a town like Old Tappan, in North Jersey, in the early 1980s. Her mother, Mary Ann, had the misfortune to be born weeks after the Japanese bombed Pearl Harbor, and growing up in New York City in those days was hell for someone even loosely connected to America’s attackers. Mary Ann’s father forbade his daughter to speak Japanese. Hever is mostly Irish and German, only about 33 percent Japanese. With pride, she calls herself a “hapa,” a Hawaiian word for a person with some Asian blood. Her great aunt, Margaret Tsoda, was a 17-year-old in San Francisco when, in 1942, she was imprisoned for three years with 8,000 other internees at Topaz Relocation Center, a concentration camp in the middle of the Utah desert that held American citizens of Japanese heritage during World War II. Norman Mineta turned 11 that November, and he spent that freezing winter in the Heart Mountain Relocation Center in northwestern Wyoming. Tsoda is still alive, at 95. Mineta was a congressman representing California for 21 years, then served in the cabinets of Presidents Bill Clinton and George W. Bush. Tsoda and Mineta are Hever’s heroes. Why do these names and these places matter to Hever? She’s a 44-year-old LGBT nonprofit warrior whom the Sixers plucked from the Smithsonian Institution. The war never really touched her. Or did it? It certainly tried. Of the nine remarkable women at the Sixers we interviewed for this project, Hever was the most aware that she, as executive director of social responsibility, stands on the shoulders of the giants who came before her. So, whether she’s helping build a basketball court that transforms a neighborhood or running a forum that might change a middle-school girl’s life, every word is measured; every moment, precious. She knows how fleeting joy can be. Hever, a high-school triple-jumper, long-jumper, and hurdler, went to Binghamton University, but just before her first winter track season, she contracted a debilitating case of mononucleosis. Over the next year, it ravaged her immune system, which is diminished to this day. Perhaps it was for the best. Perhaps, had it not been forever, she would not have majored in history and East Asian studies at Binghamton, would not have begun her nonprofit career with the American Red Cross in 2002, or been the director of advancement at the Morikami Museum and Japanese Gardens, in Delray Beach, Fla., where she met Mineta in 2010. 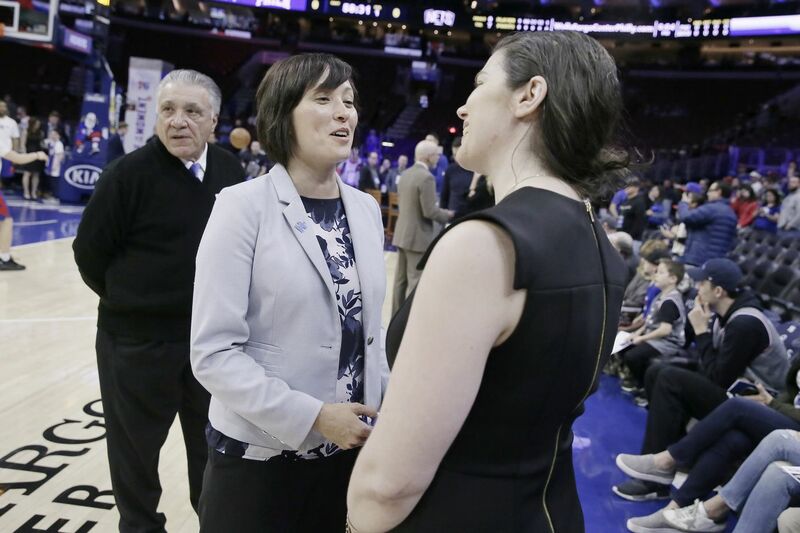 She was the senior advancement officer for the Smithsonian Asian Pacific American Center in 2014, when another friend told her about this new position with the 76ers, a billion-dollar sports franchise eager to reconnect with the Philadelphia community. After years of raising funds, was she ready to start spending them? The Sixers thought so. But then, she knows what it’s like to be marginalized. Different. Her father, Bill, who is white, was transferred to Tokyo, of all places, when she was 9. She lived there through her middle-school years.